Founded in Osaka, Japan in 1945, IDEC is a manufacturer of industrial switches and pilot devices, general purpose relays, contactors, circuit breakers, sockets, oi touchscreens, PLCs, power supplies. They are our primary automation line and as one of the first companies to bring a micro Programmable Logic Controllers (PLC) to the market are continually working to lead the industry with low cost solutions. Their next generation MicroSmart FC6A released in 2016, is at the leading edge of programmable controllers. 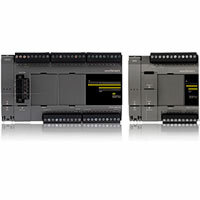 It is a small form PLC with up to 520 digital I/O and 126 analog I/O.